Many musicians, artists, writers, social activists, and tech mavens call Chicago home. The city has a strong entrepreneurial spirit, so it only makes sense that it has some of the most innovative communities for creatives, many of them residing in work hubs called coworking spaces. These modern work environments have been trending over the last decade, providing professional workstations and networking opportunities outside of homes, coffee shops, and traditional office settings. Freelancers and startups alike can enjoy coworking spaces all throughout the Windy City. When you're looking for a working area in Chicago, consider your budget, specific industry, and amenity requirements. When compared to monthly fees in New York City and San Francisco, the rates for Chicago coworking spaces are relatively affordable, though many of them are catered to specific occupations. Once you figure out what professional network you want, think about the amenities that you need. Complimentary coffee and Internet are a given at most places, but benefits like lockers and showers are not. From an office with rock-climbing perks like Brooklyn Boulders to an author's paradise like Writers WorkSpace, we compiled the very best coworking spots in Chicago. With affordable prices and a beautiful, cozy setup, Wicker Park's Free Range is an excellent coworking space for busy freelancers. Members will be able to take advantage of ergonomic chairs and spacious desks, meeting space, private phone booths, coffee, Internet, and color printing. There's also an outdoor terrace and gourmet kitchen. Pricing starts at $50 per month for virtual subscribers, who receive a physical mailing address, invites to events, and two hours of conference room bookings per month. Part-time and mobile workers get flexible passes for limited visits each month, as well as access to educational programming and networking events, printing, and the Internet. The most exhaustive package is the $285 per month deal, in which you will receive all of the amenities listed above in addition to 24/7 access to Free Range. Named after the year of the Great Chicago Fire, 1871 acts as one of the main tech hubs in Chicago and occupies 120,000 square feet in Merchandise Mart. It’s a coworking space as well as a tech startup incubator that’s home to 400 city startups. In its abundant and well-lit space, you will find a network of startups and entrepreneurs in the tech industry. 1871 offers a range of different space needs for growing companies, whether you're starting out or accelerating rapidly. There are events geared for digital entrepreneurs, such as talks with high-level speakers. The programming at 1871 regularly includes in-depth classes about design and technology, great for picking up new professional skills in the digital age. Prices vary. Independent designers and developers pay a monthly fee of $300 per month. Shared desks start at $350 per month while reserved ones cost $500 per month. Perks that members can enjoy are standing and treadmill desks, high-speed Internet, printer access, conference rooms and event space, locker rentals, a podcast studio, nursing rooms, laundry services, and drinks and snacks. Housed in Fort Knox Studio, a 160,000 square feet B2B building, 2112 is one of the best spaces for music, video, and film professionals to collaborate. It places a strong emphasis on community within the creative industry. An unreserved workspace is $250 per month whereas a reserved desk space costs $375 per month. Benefits for members include educational programming, 1-on-1 mentor hours with industry professionals, active incubation, 24/7 access, reservation of rooms, a permanent locking desk, and Internet access. There's also free coffee, water, and snacks. If you’re interested in the educational programming, mentoring, and networking events without renting a space, you can pay a much smaller monthly fee of $70. The coworking space is right next to the Portage Park neighborhood, which is near the 90/94 Interstate and several public transportation lines. If you're devoted to being your healthiest self and getting work done, Chicago's Brooklyn Boulders branch, located in the busy West Loop, is the spot for you. It, of course, originated in Brooklyn but has opened up locations in Chicago and Boston throughout the years. Designed to be a rock-climbing gym with Wi-Fi, it now has ample space for lifting weights and jump-starting your business. With a 25,000 square feet facility, the coworking space integrates physical fitness equipment with work area. For example, right above standing desks are pull-up bars. Its amenities include free Wi-Fi, locker rooms, showers, and space for pop-ups and events. Some of the sports that members have access to include bouldering, auto-belay, top-roping, and lead climbing. At $125 per month for a workspace and a gym membership, Brooklyn Boulders offers a great deal. Tucked in the northern suburbs of Chicago, LifeWorking integrates its namesake into its facility and mission, emphasizing work-life balance for the busy professional. Its standard amenities include coffee and Internet. It also has niche offerings, such as laundry service, package shipment, bike storage, and food delivery. You won't be able to access the office 24/7 for the price that other coworking spaces offer. Its costs lie in the more expensive range, starting from a monthly fee of $199 for one day access per week. A virtual office costs about half the price and will give you access to an office address and receipt of mail and packages. With this package, you get a one-day pass and one-hour conference room rental per month. Premium members get more meeting room rental hours, printing services, and access to areas such as drop-in desks and lounge spaces, plus a café. The steeper prices are a motivation for maximizing productivity in the office space and separating home from work. Homiey is a colorful, modern gathering space that’s something like an Internet café meets work office. Located in Chicago's West Loop neighborhood, it’s an upgrade to working at home or in a crowded coffee shop. Because it’s a more relaxed and casual environment, you won't find a handful of luxury amenities, but it does offer complimentary coffee and snacks, high-speed Internet, and casual seating. Members will also get access to one shared printer, one conference room, two phone booths, and one kitchenette. Homiey is a great place for professionals to meet with clients or conduct interviews. You'll also find students gathering for study groups within its facility since it only costs them $10 to stay there for an entire day. For regular patrons, the price is only $5 more. Membership is $100 per month, with longer contracts ranging from $250 for three months to $600 for one year. You’ll also be able to book out the venue for private events like baby showers, receptions, and parties. Many coworking spaces focus on the needs of digital and tech entrepreneurs, but mHUB is a haven for professionals who need to test and develop physical prototypes. At mHUB, you'll find a community of product designers, developers, entrepreneurs, engineers, and manufacturers. The 63,000-square-foot facility has ten fabrication centers that streamline product development cycles. It provides around two million dollars in resources for product design and prototyping, such as a 3D printing lab, electronics labs, metal shop, and microfactory. 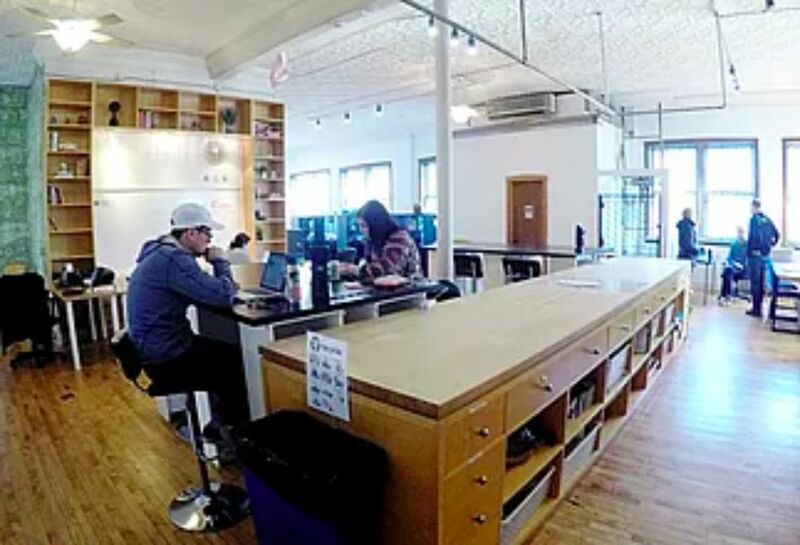 Coworking costs $300 per month whereas being in the shop full-time costs $200 per month. Coworking subscribers can enjoy desks as well as shop perks. Members will be able to take advantage of benefits such as coworking space, event space, classroom space, free design software, conference rooms, parking spots, access to storage, loading dock assistance, and manufacturing and supplier connections. If you want a space devoted to writing that is more formal than a library or coffee shop, the Writers WorkSpace is an affordable and cozy option for fiction and nonfiction writers. The studio space is quiet and free of conversation for maximum productivity. For a more social environment, you can migrate to the lounge, which has cozy seating, a library of literary magazines and resources, and a street view of Broadway. Membership depends on whether or not your application gets accepted. Full-time members pay $160 per month and get access to the coworking space from 5 a.m. to midnight, 365 days per year. Benefits at Writers WorkSpace include Wi-Fi access, printing services, conference room usage, a fully stocked kitchen, a resource library, event invitations, discounts on workshops, and locker storage. Chicago residents striving to make the world a better place should check out Coalition's two branches — Coalition Space Impact in River North and Coalition Space Energy at Millennium Park. The Impact location offers 14,000 square feet for companies, individuals, and nonprofits. Located in the penthouse suite of the Gage Building, the latter space puts a strong emphasis on sustainability. Dedicated desks start at $300 at Impact and $450 at Energy. Members receive access to Wi-Fi, coffee, kitchenettes, phone booths, an outdoor deck, lounge areas, and bike storage. Depending on your subscription fee, you can also get access to conference rooms, event space, and mail service. Other packages include a virtual desk membership for mailing services and a private office one for bigger teams. Regular events at Coalition are happy hours and programming around social impact.